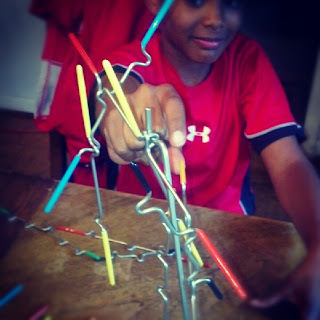 Who says you have to go easy on family while playing fun games such as Suspend by Melissa and Doug? In fact, there has been plenty of trash-talking, senseless outbursts, major taunting and loud celebrations around the table lately. Thank goodness it has all been friendly competition. 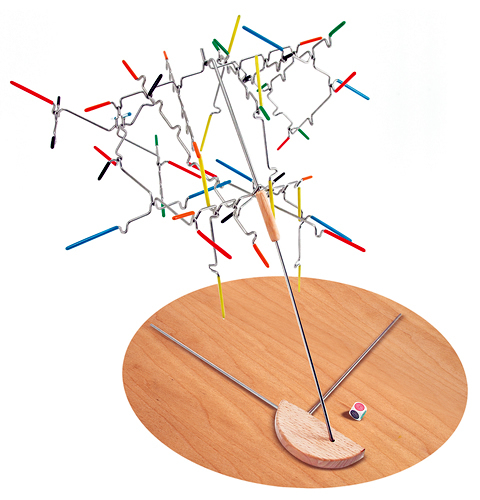 Suspend is one of many Melissa and Doug games for Kids that calls for a bit of concentration, a steady hand and logical thinking. 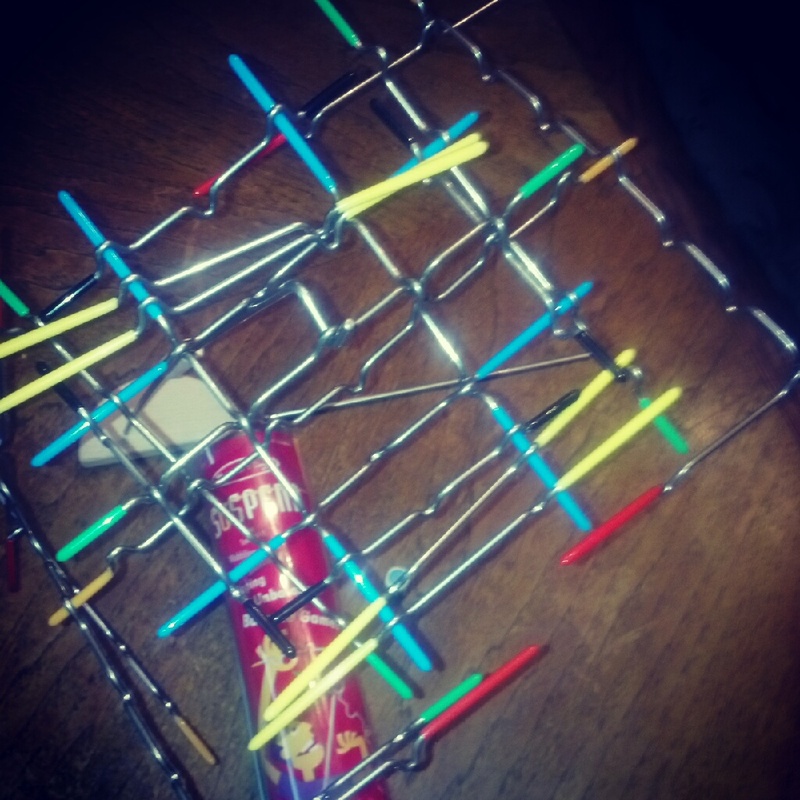 It is comprised of 24 wire pieces, covered in various colored rubber tips. The wire pieces come in different lengths and include random notches. The object of the game is to get rid of all of your wire pieces before the other players (unless you play alone). This is accomplished by rolling a dice to select a color, then balancing that specific piece on the main wire or the other pieces that been set into place by other players. Be careful! You can only use one hand to place the pieces and you run the risk of knocking of the other pieces. If this happens, they ALL become yours and you have to try your best to get rid of them. It's all about strategy...and a steady hand, as mentioned before. Easy set up. All we had to do was empty the contents from the container they came in, spread them on the table, insert a metal rod and we were done. Simple instructions. We usually read the instructions once before playing and as we are playing. I pretty much has an idea how the game was played by the name of the game and the look of it. It took us no time to start playing. Even though it is recommended for ages 8+, I think a younger child could easily get the hang of this game. Rules. I like that this game can be played with only one player (up to 4). This way your child can have something to do while you cook , get work done, or are not up to playing just yet. I also like that you can only use one hand. It adds a more difficult element to the game. Price. If you visit the GummyLump.com website, you can find this Melissa and Doug Games for Kids for the regular price of $16.99 and much cheaper when it's on sale. There is no real con about this game. If I had to say one "bad" thing about it, I would like to see it include more wire pieces for extended play and to allow more people to play. It would make for a great party game. 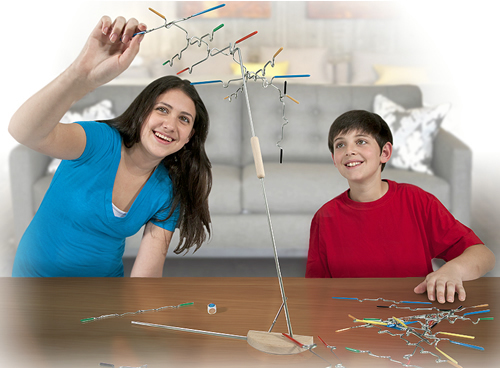 Overall, Suspend is a fun and simple family game that will keep you entertained on both rainy days and sunny days. We definitely enjoyed our time playing together. While you're on the GummyLump.com website, check out the "play food toys special offer" from Melissa and Doug as well. Disclosure Information: I was sent the Suspense game to facilitate my review, thanks to GummyLump.com. There was no monetary compensation for writing this post. The opinions and views are my own.